The Republic of Rwanda is a small landlocked country in the Great Lakes region of east-central Africa, bordered by Uganda, Burundi, the Democratic Republic of the Congo and Tanzania. Home to approximately 10.1 million people, Rwanda supports the densest population in continental Africa, most of whom engage in subsistence agriculture. A verdant country of fertile and hilly terrain, the small republic bears the title “Land of a Thousand Hills”. The country has received considerable international attention on account of its 1994 genocide, in which between 800,000 and one million people were killed. In 2008, Rwanda became the first country in history to elect a national legislature in which a majority of members were women. As for Rossisendi & His Group… There is no information available. The only clue to the origin of the band, is that the song is in Kinyarwanda (also known simply as Rwanda). Kinyarwanda is a Bantu language spoken primarily in Rwanda, where it is one of the official language of the country, as well as in southern Uganda and in the east of the Democratic Republic of the Congo. 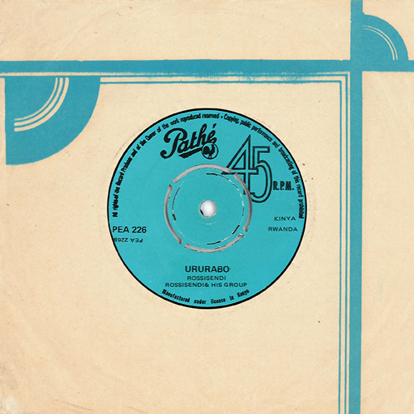 Catalog number PEA 226 on Pathé Records, manufactured in Kenya. No other information available.